With two successful Kickstarter campaigns under our belts here at One Street (Bike Shift Lever and Cures for Ailing Organizations) and also having backed five projects myself, I think I’ve accumulated enough bruises and smiles to offer some useful tips. First, when considering a Kickstarter campaign, make sure you can set aside an entire month for constant promotion and begging. Kickstarter shows that campaigns lasting more than 30 days have LESS of a chance of succeeding, likely because they lack urgency. You’ll need every one of these 30 days to connect with and respond to your most likely donors. A Kickstarter campaign can fund many aspects of a social bike business program. For instance, funding a new workbench and accompanying tools would be a great fit. You could even try to fund a building renovation or the purchase of a building, assuming you can reach out to a substantial number of likely donors. Don’t be deceived by the multitudes of Kickstarter competitors. My first venture into crowdfunding was IndieGoGo. I only convinced 12 of my closest friends and family members to contribute – major bust compared to my experience on Kickstarter! With this limited experience, I can’t claim to be an expert on the others, but I can caution you to investigate them thoroughly. Compare them with Kickstarter’s numbers. The huge number of Kickstarter donors means that most of the people you approach will at least trust the name and many will already have an account that lets them pledge to your project with a few mouse clicks. All of the Kickstarter competitors I have looked at allow every campaign to take whatever money they raise, but charge an extravagant fee if the goal was not reached. In contrast, Kickstarter only releases funding if the goal is reached (all-or-nothing) and charges a straight 5% fee of the funds raised. These competitors are rather savvy. 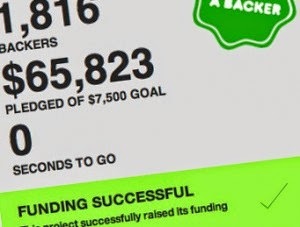 Most first-time crowdfunders will be intimidated by Kickstarter’s all-or-nothing concept. But taking less than your goal comes at a major cost to you and a lovely profit to them. On top of that, you’ll be stuck with funding that you cannot proceed with. Your donors will expect you to complete your project because their credit cards were charged, but you won’t have enough funding to do so. Investigate all of this thoroughly before choosing any service other than Kickstarter. If this is your first Kickstarter campaign, allow for at least three weeks to receive approval for your project and for your account where the funds will be transferred. Your next project will only take a few days for approval since everything will be set up. Choose a month without holidays or other likely distractions such as summer vacations. Choose the lowest funding goal possible that will still allow you to complete your project, including covering the Kickstarter fees, promotion costs, and the costs to make and ship the rewards you choose for your donors. Study similar, successful projects on Kickstarter for ideas. Spend the time and money to create an engaging video. Be careful to choose rewards you can afford, but will still entice backers; and don’t forget to add overseas shipping fees to ALL reward levels. Compliment your video with engaging text and images on your page, including a concise budget showing why you need the minimum goal. Put time into writing out the Risks and Challenges part of the page. This gives your project the human touch and makes it believable. Ask Kickstarter support to add any “tags” that match your campaign; for instance they have a “Bikes” tag that brought seven backers to our shift lever campaign. Don’t count on strangers or Kickstarter visitors to pledge. If your campaign creates a great buzz, like our shift lever did, you will enjoy this bonus. But if it never gets past your own promotion efforts, as our book never did, you will have to scratch and scramble for every single pledge. This is most likely! Be prepared. You will be more than busy during the campaign, so write up and prepare everything you can in advance. Prepare lists of potential donors, media, and networkers. Separate these lists for delivery method – mailing, email, press release, blog posts, social media, etc. If your community is likely to support your project, schedule in-person events where you can show off your project in a relaxed, party atmosphere, with computers ready for their pledge. Create a schedule for engaging these lists and events. Some, such as your email and social media lists, can receive your pledge requests several times. Others, such as your media list, should only receive your press release once, so schedule it early in the campaign. Prepare and write out your initial emails, blog posts, and press release. Give them a personal voice because Kickstarter is all about people helping other people. Sell yourself and your personal story along with your project. Invest in a mailing such as postcards or simple brochures since such hardcopies tend to sit around and act as reminders for people to pledge. You can also use them as handouts. Prepare for many varied ways to reach people, including ways to reach the same people through multiple channels. Busy people have to see something many, many times before they will be persuaded to act. You’ll only have 30 days to do this! Do not send any of your promotions out before the campaign is live on Kickstarter. If people go to the link and find it’s not live, they will not bother returning. Engage your promotion plan and stick to it throughout the month. Post your list of FAQs at the bottom of your page within the first week. This offers a fun way to enhance your personal story by showing your interaction with backers and gives you another excuse to post an update i.e., FAQs posted, please offer more. Post at least one update each week of your campaign offering progress, starting each by thanking your backers and always asking them for help spreading the word. Also offer the latest news on media coverage and other developments. Frequent updates also up your campaign’s chances to be featured by Kickstarter. Beware of spammers in your first week. With Kickstarter’s success, they have multiplied. Ignore their calls to promote your project or produce your product. Respond to every legitimate interaction! Thank every one of your backers (Kickstarter has an easy way to message backers through their Backer Report page). Even people who oppose your project will appreciate your response and may become your best networkers. Use their objections to create more FAQ entries. Also, some newcomers to Kickstarter will need guidance on how it works before they will pledge. Some people will have no interest in your project, others will be ecstatic. Don’t get hung up on the folks who aren’t interested. Focus on pampering those who love it. Your backers will be some of your best promoters because they want the campaign to succeed. I know when I back a project, I get nervous for its success and want to help. Don’t forget to ask your backers to spread the word! Some people will only be networkers and will not pledge. Adore them! I can think of a few for each of our projects who contributed significantly to our success by promoting them much farther than we could have. Work hard to reach one third of your goal in the first ten days. There is always a midway lull. By stoking the campaign early, your potential donors who come in at the end will see there’s a good chance of success and this will encourage them to pledge. Without those early pledges, many will expect it to fail and won’t bother. Even if you reach your goal before your deadline, do not announce success until it is over. Donors can reduce and even withdraw their pledges up to 24 hours before the campaign ends. This happened a few times with our shift lever campaign, adding significantly to my heartburn. If your campaign succeeded, send an enthusiastic thank you update to your backers including next steps, and announce your success wherever you had posted the campaign. If it missed, send the news to your backers and let them know your revised plans for funding your project. You can even retry Kickstarter once you’ve recovered. The funding will transfer to your designated bank account within two weeks of success, but get started on your campaign promises immediately, including sending out rewards. Leverage your success to promote your project further and gain media coverage on its next exciting steps ahead. Kickstarter is NOT for the faint of heart or for those without a full month to devote to their campaign. Prepare yourself for 30 long days of expectation, dashed hope, jubilation, desperation, planning for failure, guilt for begging, and, if everything clicked, exhausted celebration. I’d also recommend setting aside another week for recovery. If all of this sounds like a nice way to spend a month, go for it! I wish you good luck and emotional stamina. With success it will all be worth it in the end. Do you have further tips to offer from your Kickstarter or other crowdfunding experiences? Please offer them in the comments box. Thanks so much for this valuable advice! My pleasure. I hope it helps!